In 1978, Harvey Milk asked Gilbert Baker to create a unifying symbol for the growing gay rights movement, and on June 25 of that year, Baker's Rainbow Flag debuted at San Francisco's Gay Liberation Day parade. Baker had no idea his creation would become an international emblem of freedom, forever cementing his place and importance in helping to define the modern LGBTQ+ movement. 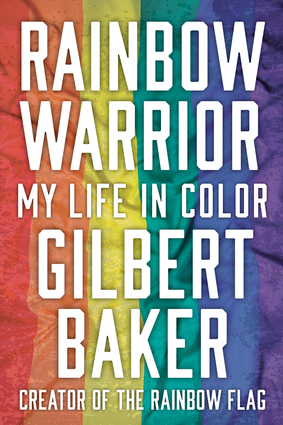 Rainbow Warrior is Baker's passionate personal chronicle, from a repressive childhood in 1950s Kansas to a harrowing stint in the US Army, and finally his arrival in San Francisco, where he bloomed as both a visual artist and social justice activist. His fascinating story weaves through the early years of the struggle for LGBTQ+ rights, where he worked closely with Milk, Cleve Jones, and the Sisters of Perpetual Indulgence. Baker continued his flag-making, street theater and activism through the Reagan years and the AIDS crisis. And in 1994, Baker spearheaded the effort to fabricate a mile-long Rainbow Flag—at the time, the world's longest—to celebrate the 25th anniversary of the Stonewall Uprising in New York City. Gilbert and parade organizers battled with the newly elected Mayor Giuliani for the right to carry it up Fifth Avenue, past St. Patrick's Cathedral. Today, the Rainbow Flag has become a worldwide symbol of LGBTQ+ diversity and inclusiveness, and its rainbow hues have illuminated landmarks from the White House to the Eiffel Tower to the Sydney Opera House. Gilbert Baker often called himself the "Gay Betsy Ross," and readers of his colorful, irreverent and deeply personal memoir will find it difficult to disagree. Artist Gilbert Baker created the first Rainbow Flag in 1978, and was a longtime LGBTQ+, peace and AIDS activist. He died in 2017.